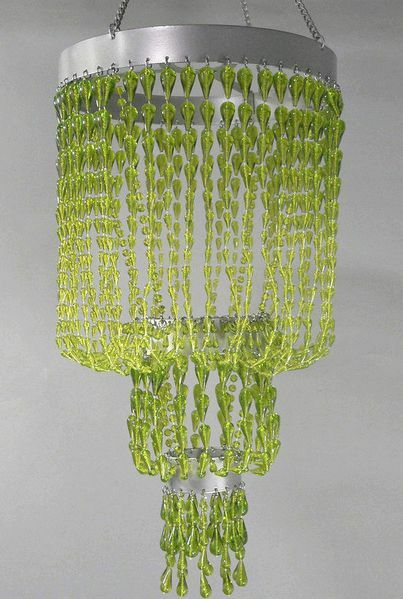 Home > Lighting > Chandeliers > Chandelier Raindrops - Green Non-Iridescent 24"
We also have a beaded curtain with these exact same beads! Holy cow! A cool chandelier for less than $5 bazlillion bucks! This fun 2' chandelier is made of acrylic raindrop shaped beads and is NON-Iridescent (no pearly coating)....the lamp looks awesome with the light on or off but this is a chandelier decoration and does not come with a Light Cord Kit but it is designed to hold one. The center of the chandelier already has the hardware needed to hold the light kit in place. We have matching beaded curtains with or without the iridescent coating so that you can complete the look! 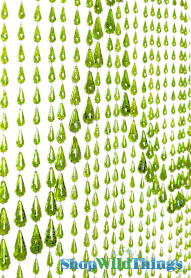 Make sure to take a look at our Raindrops Soft Green beaded curtain which has the exact same beads!